In case you haven’t realized yet, I love trying new recipes. I just don’t have the time to make anything super complicated since I have to basically prep during nap time because Zachary gets a little possessive when I am in the kitchen and wants my attention. I decided that I wanted to try to make meatballs the other day. 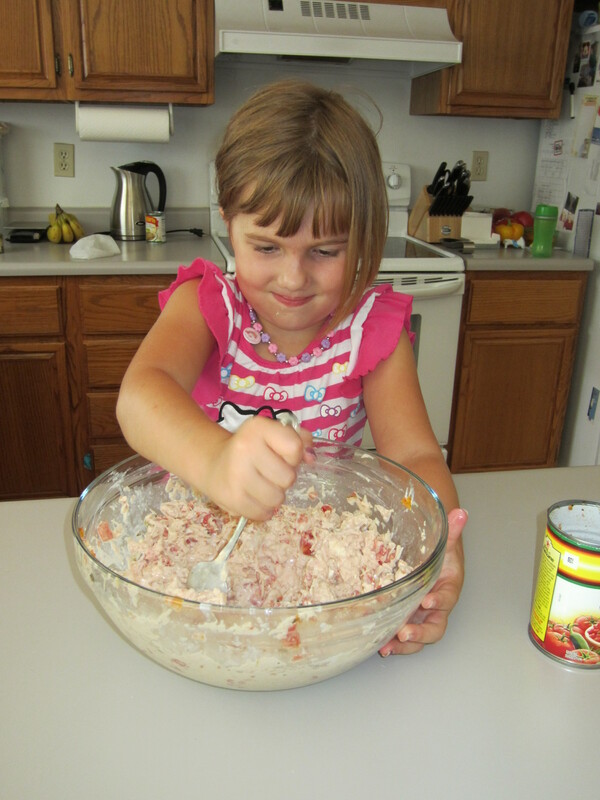 I combined a recipe that I found on……Pinterest and from a fellow playgroup momma. They were very delicious. Emily kept telling me how much she loved them. She even ate leftovers the next night. Not that there were many left. 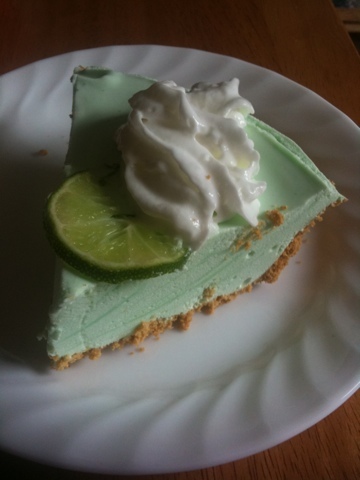 I wanted to share the recipe as I made it. In parenthesis are the original ingredients and directions. Mix together & shape into golf ball size or little larger meatballs, put the mozzarella chunk in the middle. Put on cookie sheet & bake 350 degrees for 8 minutes then turnover for another 5 or until browned slightly. (Remove to strainer and rinse under water to remove excess grease. Squeeze each gently with paper towel to squeeze out grease and dry. I skipped this step because the turkey was so lean.) Can be frozen in ziplock bag or cook in spaghetti sauce. To cook in sauce…simmer on low 4 hours in the crockpot or on high for 2 or more hours. I followed the original directions and started it out on high for about 45 minutes and then turned down to low. I served with spaghetti noodles but you can also serve as meatballs subs or just plain meatballs. The meatballs were so yummy with the melted cheese in the middle. Ever make a meal that was super easy to prepare and tasted great? I really enjoy cooking and baking. What I don’t enjoy is cleaning up the mess I make. Unfortunately, I don’t cook as much as I want. No, we don’t eat out a lot. I just have a several meals that are my “go to” that I can just pop in the oven. You know, super easy. Zachary makes it really hard to cook. He is underfoot. All. The. Time. He wants picked up or he is pulling things out of the cabinet. Or opening the refrigerator a million times. Annoying enough to make me not want to cook until he’s older. I ran across a few recipes that I have been wanting to try. I am sure I have mentioned how much I love cookbooks and recipes. I decided to finally a few out the other night. One I could prep while he was napping and just pop in the oven when it was time to prepare. I bet it would be a really good freezer meal too. The other, a dessert, I just put in the crockpot. Super easy. Emily loved the bake and even asked for seconds. ***** I used a pound of ground turkey, low fat sour cream and low fat cottage cheese. Preheat a large crock-pot on high heat and preset it for 3 hours. In a large bowl, mix brown sugar, walnuts, margarine, and cinnamon. Fill the apples with the filling and place them in the crock-pot. Pour in the apple juice or cider and the liquor, if using. Cover and cook 2 1/2 to 3 hours on high heat until the apples are soft and begin to collapse. Emily is becoming quite the chef these days. 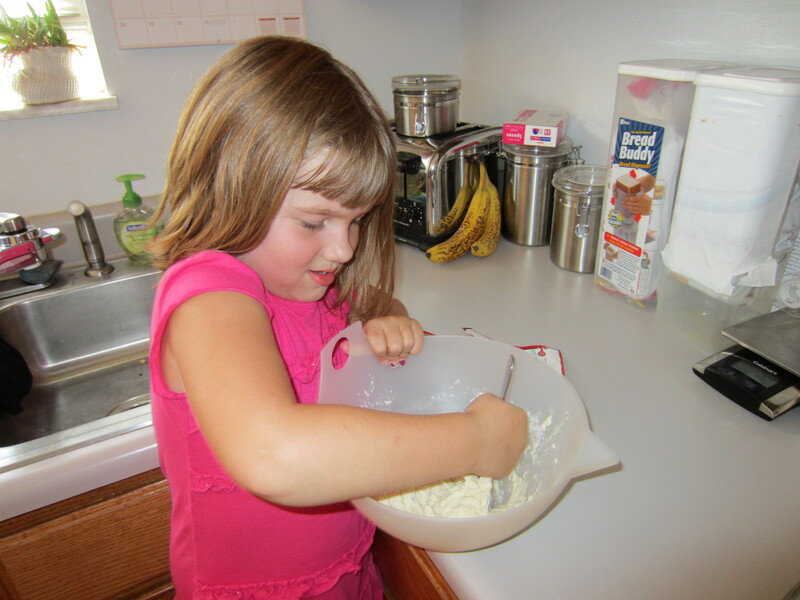 She has been helping me bake muffins, cookies and cakes. She also made dinner by herself twice in the past few weeks. The first dinner a la Emily was pizza. It was her first attempt at making dinner pretty much on her own so I thought we would take the simple route. I bought a package of “make your own pizza dough” and let her add the water and mix. 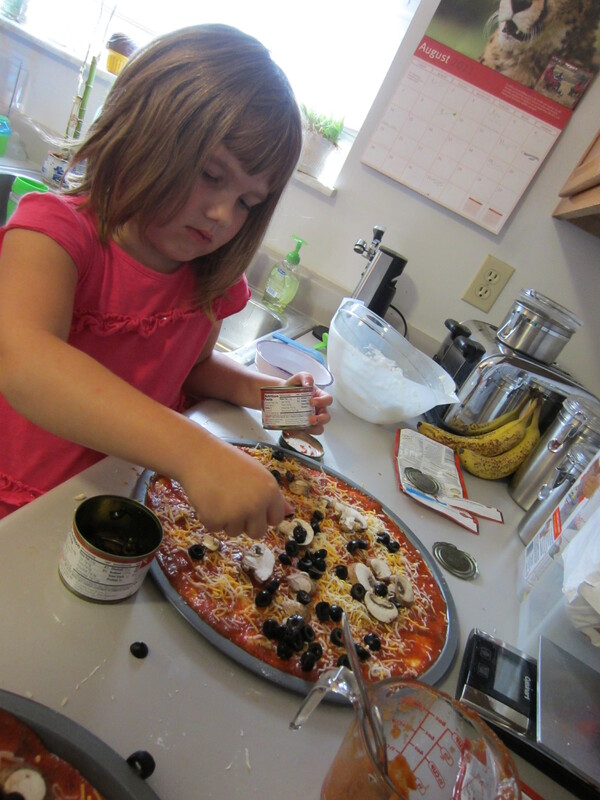 She then spread it out on the pan and topped the pizza with sauce, mushrooms and black olives. Dinner was delish that night and I didn’t have to make it. For the most part. 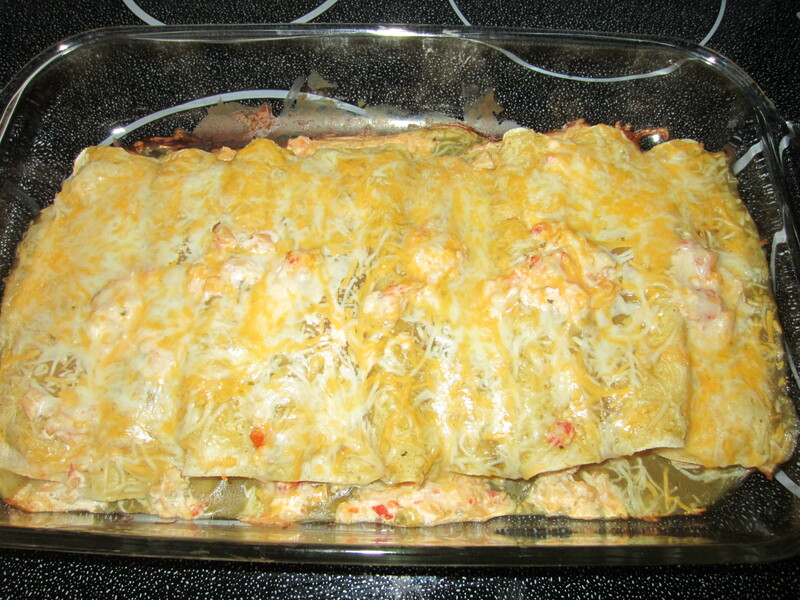 The second meal Emily made was enchiladas. I didn’t follow a recipe, per se. I pretty much merged a couple of recipes to suit what I had on hand and what was easy enough for Emily to do on her own. And she did it all. 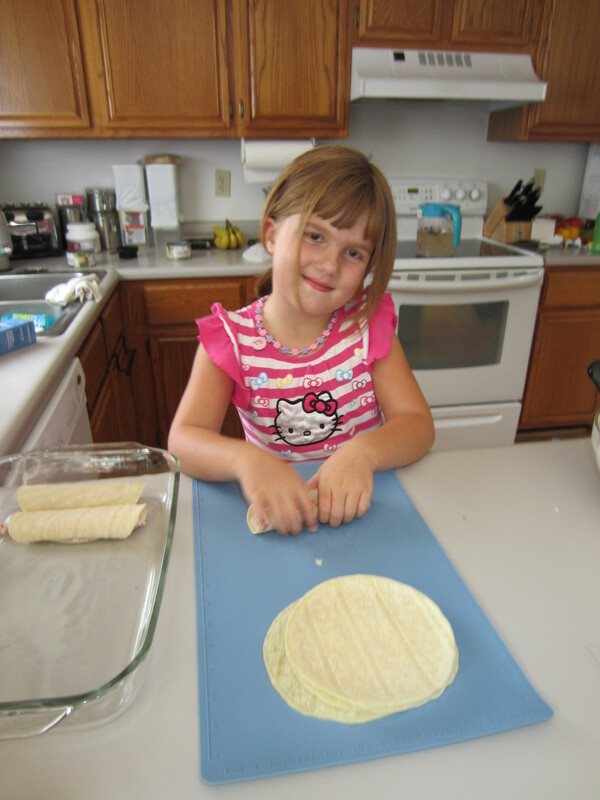 She mixed the ingredients and filled the corn tortillas. She really enjoyed rolling them herself. Add some enchilada sauce and cheese. Voila! Dinner you can sink your teeth into. If you want to know the ingredients and how she made these yummies, let me know! Another recipe. I love cookbooks and I love trying new recipes. This recipe was actually found via an internet search. I had a bunch of asparagus in the crisper that needed to be used. Stephen found a beautiful bunch at the greenhouse/produce stand and couldn’t pass it up. I was more than willing to deviate from the menu and come up with something different. I could have just steamed it but seemed boring to me. Clickity clack (more like touch, touch) and up popped a recipe that I knew was a winner! Cook the pasta in a pot of boiling water according to package directions, 9 to 10 minutes. Drain and set aside. Meanwhile, heat oil in a large skillet over medium. Add chicken and cook until lightly browned, 5 to 7 minutes, stirring. Add asparagus and basil and cook until softened, 3 minutes. Add salt, pepper, and wine; bring to a boil over high heat, reduce, and simmer until liquid is almost gone and chicken is cooked through, 3 to 4 minutes. Add reserved pasta and cheese to skillet; toss to coat and serve immediately. Have you ever made a meal that was so easy but yet so yummy? So delicious that thinking about it makes your mouth water, wishing for another serving? That was my dinner last night. Wondering what I made? Two very simple dishes. Both prepped the day before so there was really nothing I had to do. Without further ado, the recipes! Let me know if you try them and what you think! In a plastic container with a lid, combine all vegetables. In a separate container, combine and mix vinegar, oil, Splenda and water. Pour marinade over veggies, cover, and place in fridge for 24 hours. Season to taste with salt and pepper. HG Tip: This is even yummier after 2 days! Makes five generous 1-cup servings. NOTE: I also added some yellow and green peppers because I had them on hand. I also was out of Splenda so I substituted a tablespoon of sugar. Increased the calories a bit but really wasn’t a deal breaker in my opinion. Place the pork in the insert of a slow cooker. In a small bowl, whisk together all of the remaining ingredients. Take the liquid mixture and pour it over the pork. Use your hands to rub the mixture into the pork, coating it well on all sides. Place the lid on the slow cooker insert and refrigerate overnight. Cook on low for 8 to 9 hours, or until the pork is tender. Remove the pork from the slow cooker and shred or pull into larger pieces. NOTE: I didn’t have any garlic. I didn’t realize I was out until it was too late so I just substituted garlic powder. I am sure the flavor wasn’t as intended but it was still “oh, my, goodness” good.